I used to watch this show all the time as a kid. What freaked me out was my Mom's maiden name was Shultz. But my family was from Norway not Germany. But who knows, maybe I got some relatives who did some bad things. It is what it is I guess. Labels: Hogan's Heroes, Shultz, Zombies. Sergeant Schultz?! Awesome! Some things come out of nowhere; used to watch this often as well. Great little blurb. Sergeant Schultz! One never knows what he will awaken to. 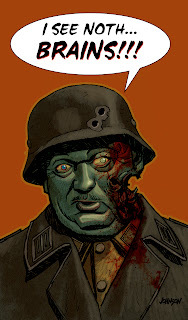 Great zombie choice and illustration. Thank you. HA HA HAH!! Dude, I love this! Funny, but beautifully rendered! I used to love that show. Now I love this. I guess it works out somehow.